Sympathy. Empathy. Pathetic. Antipathy. Pathological. Pathogenic. The Greek root path can mean “feeling” or “disease.” When we talk about pathos, we are focusing on an appeal to emotion. It is often the easiest aspect of the rhetorical triangle to identify and even to create. However, it can also be the most treacherous for an audience. Pathos is highly sensory. Figurative language is the ultimate go-to here. Imagery, metaphors, and similes are fairly reliable ways to appeal to an audience’s emotions. For a more sophisticated writer, nuanced language like juxtaposition, antithesis, and the use of tone shifts can create a complex emotional response. Ultimately, though, pathos needs to appeal to something abstract in us, like our sense of duty or our utilitarianism. Instead, encourage students to name the audience characteristic that is targeted by the appeal. It is worth generating a list of audience traits and values for a given text. For example, an audience may value equality, freedom, democracy, duty, and hard work. 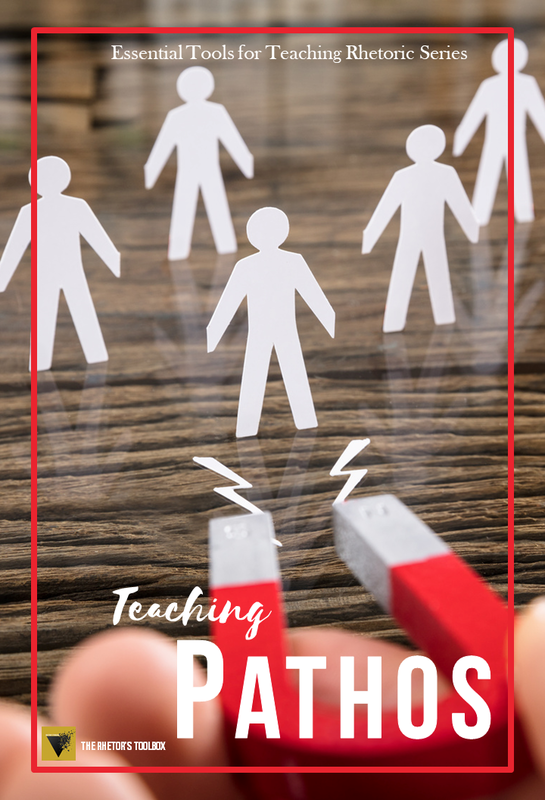 A student might then write, “The author uses metaphors to appeal to the audience’s sense of patriotism and duty.” Try using children’s books, Super Bowl commercials, print advertisements, and Presidential speeches to teach analysis of pathos. In argumentation, students should use pathos carefully. They must be sure to balance their use of pathos with their use of logos and ethos. In my classes, I tell my students to be responsible when manipulating others’ emotions. Their pens are powerful. I like to remind my students of their impact with this tapestry from Society 6. It’s one of my favorite classroom decorations!